The gist: Self-doubt is hard to overcome but can be done by anyone who knows the steps to take. Follow this guide to stop letting your insecurities hold you back. Self-doubt is a special kind of hell. A small failure makes you question your abilities and, next thing you know, you feel like you aren’t good enough or smart enough to do anything. And that’s when you stop trying. We’ve all been there but, not everyone handles it the same. In high school, he repeats his sentences to himself. Everyone thinks he’s slow. He applies to college, but fails the entrance exams. Eventually, he earns his degree but can’t get the teaching job he wants so he spends his days working in a boring patent office. But, through the many years growing up and thought of as a nobody capable of nothing, the young man told himself a different story. He knew he was good at something, and that something was science. Einstein was a genius. We all know that today, but it was far from obvious in his formative years. Did he make the impact on the world he did just because he was smart? Does intelligence shine through despite the odds? Probably not. Lots of brilliant people never overcome the hurdles of feeling they like they don’t belong. Brilliance was one critical ingredient in the Einstein formula, but an equally important element was his ability to overcome his self-doubt and keep working. Today, there’s convincing evidence that how well you perform in life depends a lot on how much you believe you can improve when it seems like you’re not achieving anything. A Stanford-backed study of 643 Australian high school students reveals some interesting data about how the belief you hold when you’re in the self-doubt death spiral affects your ability to perform and achieve goals. The data was clear: the kids who believed their intelligence can change achieved higher test scores, got better grades, and were more motivated and engaged learners. Basically, the kids who thought they could get smarter actually did. Those high-flying “be your best self, you can do it you handsome devil, you” inspirational sermons are great for people with high self-esteem. They’re just what you need when you believe in yourself and you need that little push over the edge to amp up your performance. It’s like the words activate a hidden energy in your cells that inspires you to spring into action. What studies have shown is that we’re pretty bad at talking our way out of a rut (but we can get better with help). So what actually does work? 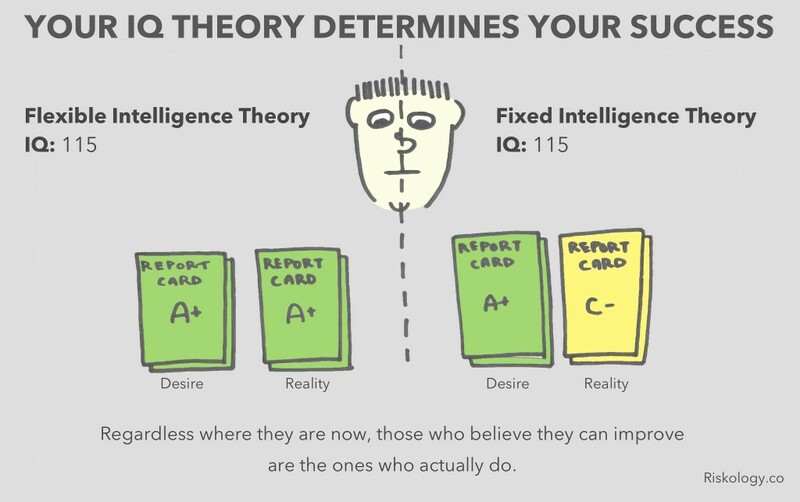 Like Einstein and the students from the study above, how do you get yourself to believe you’re capable of more and then actually boost your performance to match that belief? It’s easier to act your way into a new way of thinking than to think your way into a new way of acting. One of the key principles of psychologists who help people struggling with depression is to get them to downplay everything they’re thinking and convince them to start doing things, even if those things don’t feel right at first. Rather than try to convince yourself you can do better, just give it a shot. Even if you fail, action is motivating and encourages you to try again which—of course—increases your odds of success and gets your thoughts headed the right direction, too. Psychologists have discovered that how you remember your past determines how you feel about yourself in the present. Do you focus on the negative—the failures you’ve experienced? Or the positive—the successes you’ve engineered? When you’re stuck in the pit of self-doubt, your attention is consumed by it. Even if it’s not true and not a big deal, you make it true and turn it into a big deal in your head. You create the elephant. And just like it took a series of small but important actions to sink to that level, it takes small but important actions to climb out. Small wins are motivating because you see real progress being made, and the momentum built by those tiny changes adds up quickly. Self-doubt is hell to overcome, but it can be done by pretty much anyone who knows the steps to take. What it really comes down to is placing yourself in the right circumstances, even when you don’t feel like it. Getting out from under the funk of self-doubt depends on finding a small action to take that you can succeed at and will build on the next one. When you do that, you become unstoppable and success is more a matter of when and not if. Einstein holds the regard he does today because he was a relentless genius. But on the path to releasing that genius were many opportunities for it to shrink away under criticism and self-doubt.